If there ever was a sci-fi universe that deserved wonderful polish and a brilliant set of motion control mechanics, it's Star Wars. Elements of the fan-loved space epic offer up so much potential for hardware like Microsoft's Kinect; too bad the execution here doesn't do the franchise justice. If the Kinect actually worked consistently, this review might have been a positive one. On most levels, Kinect Star Wars is a decent collection of mini-games. What breaks the experience, aside from the intergalactic dance-offs, is the Kinect's functionality. The most frustrating in that pack of problems comes from what is arguably Star Wars' most adored and potentially great mechanic: lightsaber fights. In principle, the Kinect should offer one-to-one control. The game teaches the player as if the Kinect will read their actions correctly 100% of the time. It doesn't. You're meant to block directional attacks by holding the false saber in four locations (above to block above, to the right to block to the right, etc.). This rarely ever worked for me. In fact, most lightsaber battles played out in the exact same fashion: I blocked whatever I could until I was able to spaz-swing at the unblocking opponent in front of me. Now that I've actually written it out, that's actually exactly what most of Kinect Star Wars comes down to: spaz-swinging. The short story mode, the lightsaber dueling mode and the Rancor driving destruction mode (okay, that one is actually remotely enjoyable) all play out in just about the same fashion. You'll try your best to do things realistically until you realize the Kinect just isn't up to the task. Every moment of combat and destruction gets weighed down by flawed and failing control. The portions that work the best? Vehicle driving and, unfortunately, dancing. 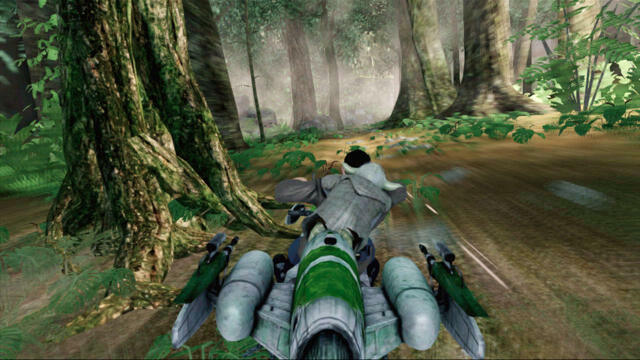 If this had been a game that featured nothing but landspeeders, speeder bikes and podracers, it would have been a blast. These segments work exceptionally well as on-rails snapshots of Star Wars' most action-packed sequences. Aiming, throttling and steering all work with subtle leans during play. It's actually a good set of mechanics that make sense immediately. It's just too bad that the same can't be said for the rest of the game. For what it's worth, my playing area meets the Kinect's standards perfectly. The system sits in my basement in front of nearly 20 feet of open play space. The Kinect requires 10 feet. This was not an instance of user error or improper setup. The production value of Kinect Star Wars is decent. In fact, the fan-service within the game is almost worth the price of purchase for anyone that can get over the atrocious controls. I could spend an entire editorial discussing the obnoxious nature of the dancing component; instead, I'll leave it at this… It's there. Kids will probably enjoy it. If you're a die-hard Star Wars fan who is downright offended by its presence, you're going to need to ignore it. It's not mandatory. Just ignore it. If you're a parent considering this game for your kids, then, assuming they both love Star Wars and aren't of an age to discern poor controls, this game might be a solid pick up. There's a lot of content to enjoy for your younger ones, and each game mode offers up a unique batch of controls and scenarios. Be warned, they will spend an obnoxious amount of time swinging at upright lizards and robots. 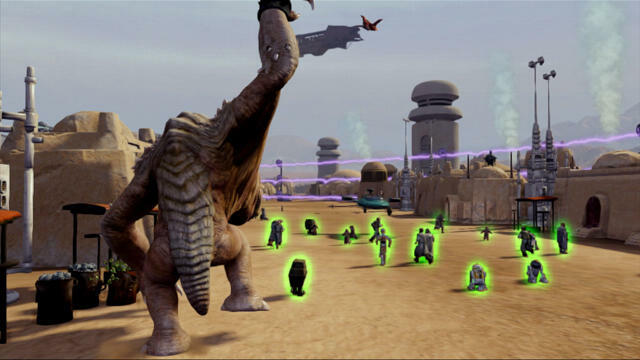 If you're a gamer with a sense of what's good and what isn't, think real hard about giving Kinect Star Wars a go. A 5 on our scale represents a completely mediocre game. The Kinect controls here are primarily what forced Star Wars below that mark. We purchased Kinect Star Wars with company funds and played each game mode either to completion or for as long as we could stand before starting this review.